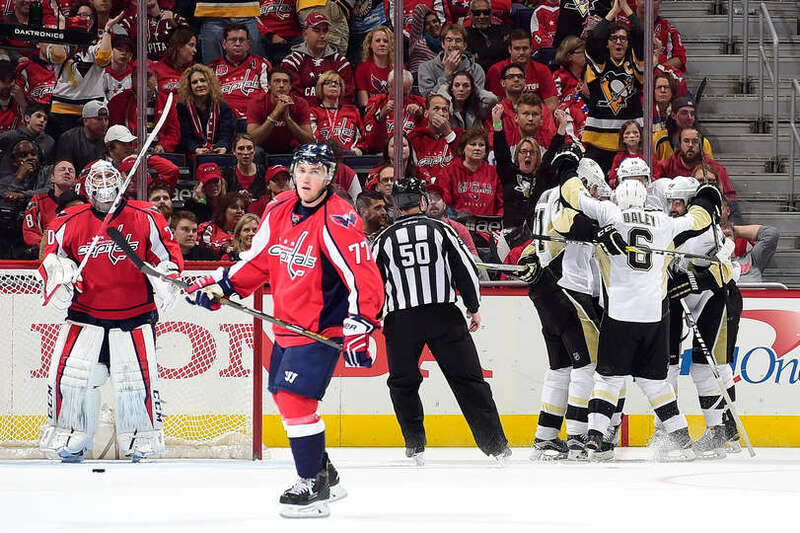 Old friend Eric Fehr tipped an entry pass from Evgeni Malkin past Braden Holtby late in the third period and the Pittsburgh Penguins evened their Eastern Conference Semifinal matchup with the Caps at a game apiece with a 2-1 regulation win. The late goal came during the Caps best period of play. The Caps outshot the Penguins 14-7 in the final frame, but as many chances the Caps had in the third — including hitting two posts — the Penguins dominated the rest of the game in similar fashion, outshooting the home team 14-5 in both the first and second periods. 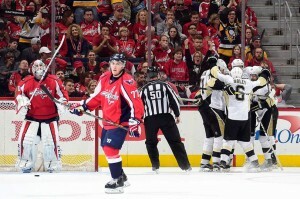 To add insult to (literal) injury, the Caps and Brooks Orpik specifically can probably expect a call from NHL discipline in the morning as a result of a late, high and utterly devestating hit on Olli Maatta in the first period which left Maatta obviously dazed and out for the game — and potentially for future games. There were no goals in the first period, and both teams wasted a single power play opportunity. In the second, the Caps decided to practice their penalty kill almost exclusively, giving the Penguins four extra-man chances. Though the Caps killed all four — and have killed 30 of 31 in the playoffs so far — the Penguins still managed to score the only goal of the period. At 7:08, Nick Bonino — who’s been a thorn in the Caps side in both games — corralled a loose puck behind Holtby (33 saves) and found Carl Hagelin alone in the slot. Hagelin lifted the pass over Holtby’s left shoulder to make it 1-0. It stayed that way until 4:08 of the third when the Caps finally made good on the power play. John Carlson’s wrister from the point was knocked down by Pens rookie goalie Matt Murray (23 saves), but Marcus Johansson was camped out and his second whack at it just managed to push it across the line for the equalizer. The Caps had a golden chance with just a little more than six minutes left when Alex Ovechkin hit Andre Burakovsky on a three-on-two, but Burakovsky couldn’t elevate his backhanded shot and Murray calmly blocked it with his legpad. Though the Caps had the better of play in the third, they could not find a go-ahead goal. That came for the Pens with 4:28 remaining. Malkin circled with the puck in the right wing circle and fed to a streaking Fehr, who had position on Orpik. Fehr’s backhanded tip flicked behind Holtby, who was moving to cover the far post. It’s on to Game 3 on Monday, and the Caps simply must find it within themselves to play a full 60-minute game on the road. A key to that will be to eliminate what has turned into full-fledged penalty problem in these playoffs. It’s admirable that the Caps are 30 for 31 on the kill, but every minute spent on the kill is more time not in the Penguins zone. Also, whatever they did at the start of Game 1 to come out of the gates like they did, they must find it again, bottle it, and re-apply to Games 3 and 4 on the road. The Penguins have all the momentum from the split at Verizon Center, now it’s up the Caps to take it back from them in their building. NEXT GAME: Game 3 at Consol Engery Center on Monday at 8 p.m.